It is possible to run many turbines in series along a single uniform penstock pipe without decreasing their efficiency. Standing still water column has pressure effect according to the depth, the greater the height of the water column the greater are the lateral and down ward pressure. But in uniform running water column the down ward pressure is uniform throughout and acts only in the direction of the water flow and has no lateral pressure. So a number of turbines installed in series can run uniformly and independently at any point of the running water column. Thus, present practice of installing only one turbine at the bottom of a running water column by applying the property of standing still water column is blunder in hydropower engineering. At present we are tapping only minimum hydropower out of the available unlimited hydropower that is possible by installing turbines in series. 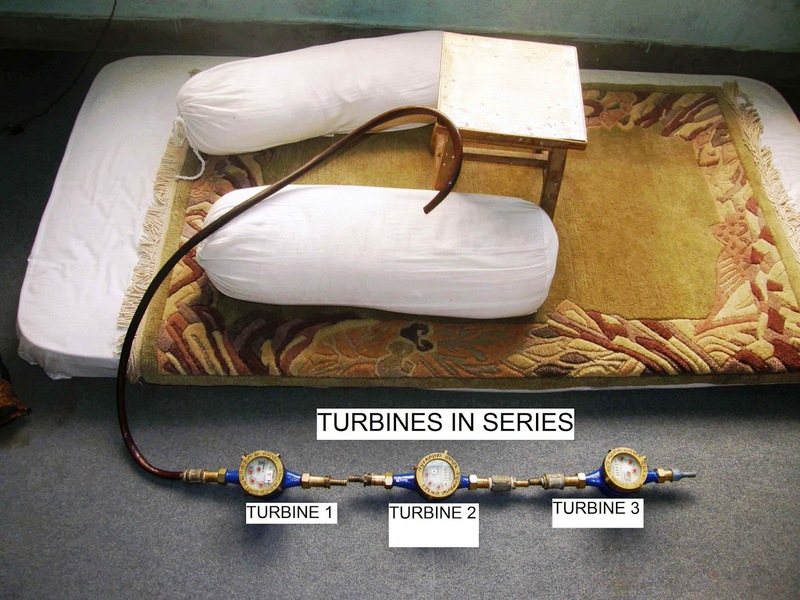 Model Turbine – water meter is ideal as model turbine. It can’t be better than those as ideal model turbines for experimental purposes. Fix any number of model turbines (water meters) in series between pieces of uniform rubber tube. (Tap – tubing – model turbine – tubing and so on). I did with three model turbines. Completely fill the rubber tubing with water, from intake to the discharge point. Then drain water from a bucket or tap. While water is running all the model turbines run simultaneously. Stop water at the discharge point or at outlet, all the model turbines stop instantly; still water remains throughout the tubing. Drain any quantity of water, all the model turbines (water meters) show the same reading. As for example, if we drain 100 ml. of water, all of them show 100 ml. of water is discharged. Explanations: – Each model turbine runs independently, uniformly, and rate of discharging water is same at any point along the uniform water running pipe. Water keeps on running consistently before and after each turbine. 1. 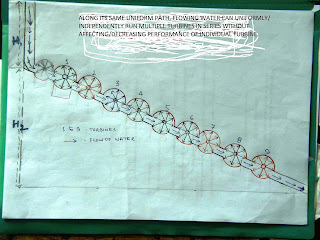 Rate of discharging water is uniform, so power of running water is not changed, remains constant. 2. Velocity of water is uniform throughout the running water column. 3. All model turbines in series rotate uniformly and independently, they don’t decrease the power of running water. So each of them can run a generator of equal capacity. Conclusion: Each of the model Turbines in series can function independently without decreasing their efficiency. 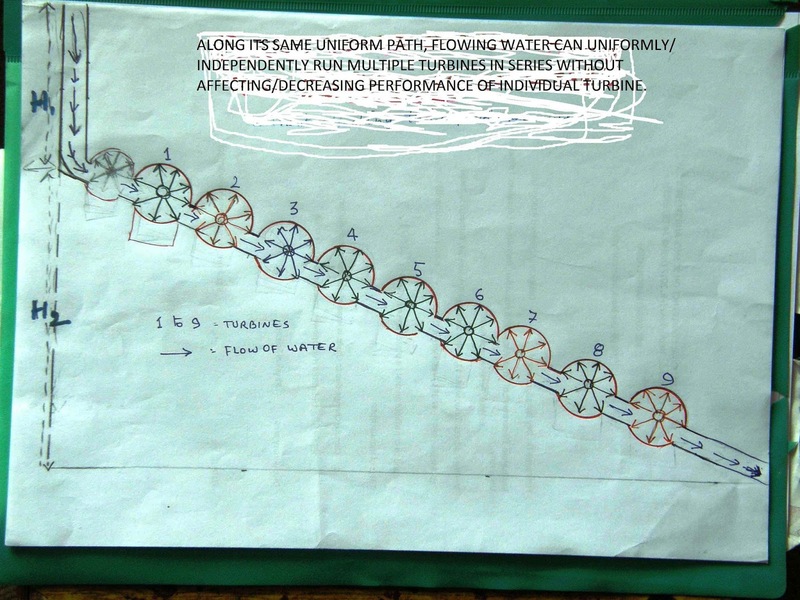 Modify the turbines in practice so that many of them can be installed in series along the same penstock pipe without breaking uniformity and continuity of running water column and thus open the door for harnessing unlimited hydropower. the Nature. No nuclear, no coal, no gas, no diesel etc. but only HYDROPOWER. 2. TOCARDO – It is also applicable in the TOCARDO system of harnessing hydropower with modification. NB: The experiment can be done by blowing air with mouth as well and get the same result. Nice Info! There are many people who wish to get the solar panel services to reduce the electricity cost at home and electricity through the sun.